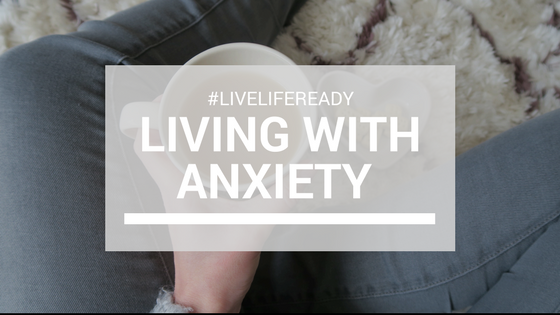 Living With Anxiety…KALMS #livelifeready Campaign! I live with anxiety everyday, some days its not noticeable and other days it completely consumes me. Most people will experience anxiety at some point in their life. But with almost one in five people feeling anxious a lot or all of the time, it has become a real problem. There is a fine line between stress and anxiety, something that is often confused because the symptoms are very similar. An example of stress is when you’ve got too much work on to actually manage or you have financial worries. You can normally pinpoint the cause of your stress. But with anxiety it is more an unease about something with an uncertain outcome. My anxiety can be over such little everyday things, that a lot of people just seem to breeze over. I’ve learned a lot about what triggers it for me and have found ways that have worked for me to overcome some of my anxiety. I’ve teamed up with Kalms to support their #livelifeready Campaign and raise awareness of the importance of spotting the signs of anxiety. The main symptoms of anxiety are feelings of apprehension, uncertainty, and worry. It’s normal to feel anxious occasionally, but for many they feel anxious regularly. For me I feel agitated, my thoughts are spinning around in my head, I have this feeling of dread and I get irritable. Having lived with anxiety I have learnt what my triggers are and this has really helped me. Well not just me, it has helped Andy too. Because living with someone that has anxiety is not easy. But, by spotting my triggers we can now work together to try and reduce my levels of anxiety. To work out what my triggers are, after I’ve had an anxious moment. Not immediately after, but later that night when the girls are in bed. I will work backwards, and find the trigger. This has become easier to do over time. I used to try avoid things that make me anxious, in fact when I am having a real low moment I do this a lot. Even though I now know this is actually counterproductive. Because actually the more I face the things that make me anxious, I take another step forward and it doesn’t make me feel quite as anxious. This is easier to do when I am not in a low point. Living in the moment. To stop for a minute and actually be in the moment, to listen, to look, to actually taste that biscuit or savour that coffee. To ground yourself to what you are actually doing, can stop those thoughts whirling around your head. Living in the moment and bringing myself back into the now, has really made a difference to me. When I was first told to try this, I thought what are they on about, of course I am in the moment. But actually that wasn’t true. I often think to myself, ‘Oh did I actually drink that coffee’, because instead of just enjoying it, I’ve been miles away worrying and thinking about something else. For me the biggest thing to help has been talking to Andy about it. He will be the first to admit that he doesn’t really ‘get it’, I don’t think he has ever felt anxious in his life. But he totally gets it, when I say I do this, because of this. It makes sense to him and he can see it too. Because he is a level headed person, he puts a lot of things into perspective for me, without taking away my right to feel anxious over it. He knows when to push me on things and when I am best left alone. He has been my rock. I first came across Kalms when I was seventeen and taking my driving test. I didn’t pass first time because anxiety, nerves and everything else took over. I was a mess. Someone recommended Kalms to me and I took them before my next driving test and whilst I still had a lot of the same feelings. My body was calmer, my legs weren’t shaking so much that I didn’t keep stalling the car. I pretty much have to thank Kalms for being able to drive! Kalms have now launched, Kalms Lavender One-A-Day Capsules, they are a traditional herbal medicinal product used for the temporary relief of the symptoms of mild anxiety such as stress and nervousness. As someone suffering with anxiety and post natal depression, but making the decision to not go on antidepressants, these are something that I know I would turn to at times when I know that my anxiety levels are going to be high. Above everything that helps me with my anxiety, is this blog. To be able to take myself away and loose myself in my writing has been the best thing. It was not long after starting my blog, that I reached out for help with my anxiety and post natal depression. It was like writing cleared a bit of the fog in my head, enough to make me see what was going on. I could talk for hours about how writing has been my therapy, but I will save that for another day. Disclosure: This is a collaborative post with KALMS.